This spring we conducted our annual call for applications for vacant board positions. The requirements set forth by HIMSS National are: Officers and Directors of the Board must be members in good standing of National HIMSS and our State Chapter for 1 year in order to serve on the board. I have to say that the Maryland Chapter had a great year of programs and events. Would you agree? The volunteer Board of Directors and Committees work tirelessly to serve the membership. The Communications Committee had a wonderful team of volunteers that well together and moved the needle forward on several communications fronts. A huge thank you to committee volunteers Marina Anwuri, Drew Bergman, Walter Bergman, Kent Budd, Erika Moon and Joyce Wedler. You are a great team! I also want to extend a special thank you to Joyce Wedler who has served on the committee for several years. She was on the forefront of getting us off the ground with social media and photography. While she is stepping down from her official capacity we look forward to her continuning to participate and mentor in the background. For the coming year Ross Martin is officially joining the team and Karen Wilding will be serving in an advisory role. This past year Ross was instrumental in producing our first video on the web site. Thank you Ross, you welcome you with open arms! The Maryland Chapter of HIMSS is an all-volunteer organization and its strength is derived from the commitment and passion of its volunteers. Serving on a committee can and should benefit both the organization and the individual volunteer. It is an opportunity for the individual to provide their skills and expertise to the Chapter to achieve specific goals while also allowing the volunteer to gain additional experience with existing skills as well as developing new skills. And best of all, it can be fun! We are always looking for volunteers that have expertise or interest in the areas of web site authoring, graphic design, Constant Contact, newsletter editing, photography, videography, LinkedIn, Twitter, Facebook and YouTube. We always would like to do more for our members but much depends on contributions of our volunteers. Something on your mind? Please drop us a line md.info@himsschapter.org . On May 15th we capped off the 2016 – 2017 Educational Season with the 7th Annual Golf Tournament at the Hayfields Country Club. This year saw a record turnout of golfers and sponsors who enjoyed a perfect day for golf, networking, food and drinks under clear blue skies. A special thanks to all of our tournament sponsor who made this event possible. 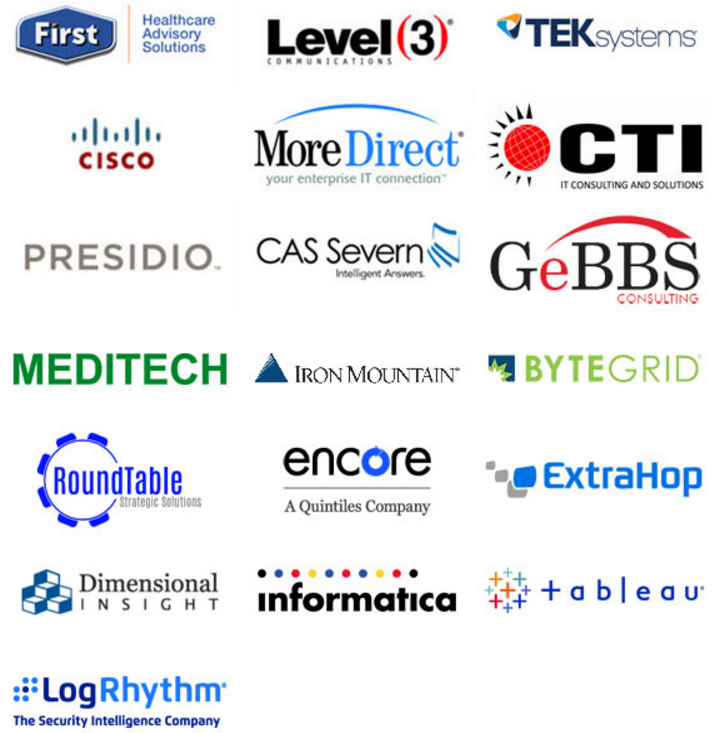 Accenture, Apex Systems, Byte Grid, Caradigm, CAS Severn, CDW, CommVault, CTI, EarthLink, First Choice, GeBBS, Iron Mountain, Leidos, ,Lightower, Medix, Netcraftsmen, PureStorage, Pursuit Health, Racktop, RMS Omega and Skyline. Collaboration has been CXO Outreach committee’s theme and this year we have seen more success with our theme. Maryland Healthcare Cost Commission (MHCC) has been a great partner with Maryland Chapter of HIMSS in bringing together programs along with Health Services Cost Review Commission (HSCRC) and Maryland Hospital Association (MHA) that have benefited membership of all the involved organizations. On March 27, 2017 we co-sponsored the Health IT Security User Education Roundtable: A Best Practices Symposium working with MHCC, HSCRC, and MHA. The event was very well attended from CISO’s to the CEO’s of several healthcare organizations. The symposium addressed end-user behavior and knowledge gaps that directly impact security in health care organizations. Industry leaders shared insights and expertise on best practices based on real-life scenarios. We hope the information can help health care organization better plan for and implement a health IT security program to manage end-user risks. On April 26, 2017 we had our CXO IT networking event that was attended by various CXO’s from several healthcare organization in the region. We had a keynote addressing “CEO Checklist by HSCRC” that was discussed by representatives from Maryland Hospital Association (MHA) and Chesapeake Regional Information System for our Patients (CRISP). This was followed by networking hour. This provided the opportunity for the CXOs to network and collaborate with their peers and in some cases an introduction to Health IT for the members of their executive team. Several CXO’s had heard about the CEO Checklist but were not fully aware of what all was involved. The MHA and CRISP representatives not only explained what it is but answered various questions and queries attendees had. This evening networking event was a perfect wrap up to the CXO committee efforts for the year. Remember, Non-Members can join the Maryland chapter by attending an event as a non-member and completing an application or by going to www.himss.org. If you are interested in joining this committee or have a question regarding the chapter membership, please contact the Brian Zernhelt, Membership Committee Chair at bzernhelt@primesoft.net or 410-740-1910 x104. Our Spring Educational event drew nearly two hundred participants to the Ten Oaks Ballroom in Clarksville on the evening of May 4th to explore healthcare’s digital transformation and the journey toward making the patient experience as seamless as ordering coffee at Starbucks. The group enjoyed networking and hors d’oeuvres to open the evening with three Maryland digital transformation success stories as well as dinner and networking over dessert. Michael E. Ruiz, Vice President and Chief Digital Officer at MedStar Health, wowed the group as he opened with a thought provoking keynote address on his vision and progress towards designing the ideal customer experience in healthcare. Our world has changed and consumers are now expecting a personalized, high-value customer service experience driving healthcare organizations to develop business strategies leveraging digital capabilities. Working closely with MedStar’s Chief Information Officer and Chief Innovation Officer, Mike shared his collaborative approach to digital transformation focused on interactive marketing, access to care, digital engagement, and analytics. He closed encouraging ‘out of the box’ thinking from the audience based on how much potential there is in transforming the future of healthcare. He shared his vision of improving care and even saving lives using innovation such as 3D printing of prosthetics, virtual reality for therapy and rehabilitation, consumer chatbots, and autonomous vehicles for delivery. Participants enjoyed a Maryland case study on Facilitating the Coordination of Care with secure texting communication delivered by Karan Mansukhani, Project Manager at CRISP. They also learned from a success story on Analytics and Teamwork as Drivers of ACO Quality Measure Improvement based on the Greater Baltimore Health Alliance (GBHA) ACO. Juan Negrin, Enterprise Business Intelligence & Analytics Manager at GBMC partnered with Megan Priolo, Chief Operating Office of GBHA, in sharing this case study. Kathryn Whitmore (KathrynWhitmore@STSConsultingGroup.com) at 443-742-4643.